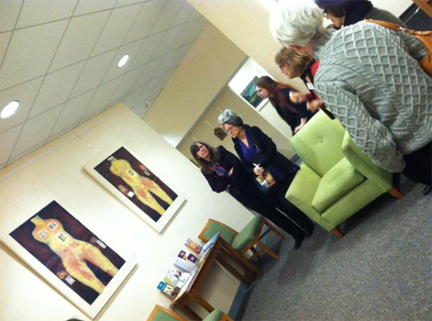 Iona hosted a lunch and artists’ talk with exhibiting artists Helga Thomson and Norma Schwartz. Helga, a printmaker is artist in residence at Iona and Norma, a sculptor is special guest artist. Their work hangs until April 30, 2015 and there will be a free Meet the Artists Reception at Iona on Friday, March 20 from 5-7pm. A few of us were able to attend the lunch and we were joined by CHAW Education Director, Amy Moore. It is a beautiful show and I found the artists’ discussions of process, ideas and experiences fascinating. I think the biggest take-away for me was the re-affirmation that age does not mean the diminution of creativity or edginess and regular practice is the secret to a successful artistic life. I think we all felt driven to get back home quickly and start creating some new art. This entry was posted on February 24, 2015 by ellen3c in Printmaking, Sculpture and tagged Aging, Amy Moore, Food, Helga Thomson, Iona Wellness & Arts Center, Learning, Norma Schwartz.